There are several situations in which you need to change the lock of your home. If your property has recently been vandalized or broken into, you will want to change your locks for sure, but also you could have lost your key, or someone got away with it. Incase you recently rented a new apartment, you certainly want to change your locks (in case the previous owner duplicates theirs). Reasons for changing your locks are plenty, but buying new locks to your home can be quite expensive. Worry not, there is a cheaper way change the keys to your locks to protect your home: rekeying your locks. 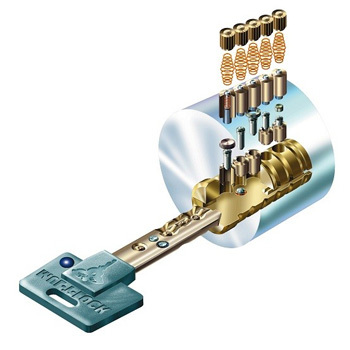 Re-keying is the process of changing the pins inside of your existing lock to suit that of a new key. By doing it yourself you can spare yourself some money on paying a locksmith, although we recommend to look for a professional to perform a rekey. This DIY guide was written to explain what it takes to rekey your locks and comes with step by step instructions you can follow when rekeying your deadbolt lock. If you are up for the task! Please note: keying kits come with a step by step instruction manual. This guide does not substitute your instruction manual. A keying kit can be bought everywhere, from Amazon to Walmart, of-course your best choice is to buy a kit from your local locksmith. Besides a keying kit, you will need some other tools to rekey your lock. These include needle-nose pliers, tweezers and a screwdriver. A kit can be used to rekey six times. It is also specified in the instructions which type of bolts and locks the kit can be used for, so make sure you buy accordingly. Slip the wire tool into a slit separating the knob and the rest of the lock. Instead of a wire tool, you can also use an unbent paperclip. Insert your current key into the hole and slowly turn while depressing it. The knob will come off. Remove the knob sleeve from the back of the knob and take off a cylinder-shaped object. That is your cylinder housing. Encircling the hole to which you insert your key is the retainer ring. Hold this retainer ring against the gap in the retainer ring tool and pop it off. A retainer ring is the tool that looks like a wrench. Also, put away the retainer ring for when you reassemble the knob later. Insert your key back into the hole and turn it either to the left or the right. This will separate the top and bottom pins. Follow with pushing the plug follower into the cylinder. Keep a constant pressure because the pins in the cylinder plug might fall down. Take out the pins and your old key from the cylinder plug. Insert a new key, and replace the pins with new ones according to the instruction sheet. Use tweezers or pliers for an easier job. The small pins are arranged based on colours or numbers. And you will have your knob that now works with a new key! Before you start working, make sure you bought the right rekeying kit with pins and keys that are suitable for your brand of locks. Lightly oil your keys before rekeying to make sure that they key will turn smoothly. Do not work in a slippery surface, in case that the pins fall out and roll away. Work in a rougher surface or a box or container that could keep them from falling and getting missing. If the pins were accidentally removed from the cylindrical lock, do not fret, there are instructions in the information sheet in order to put them back together. If the information sheet does not contain any order to arrange the pins, or if there is a lack of information sheet, insert the pins by trying on them one by one and seeing if they fit the key.